Information is key to goal setting and to see the positive changes that go along with a good workout program. 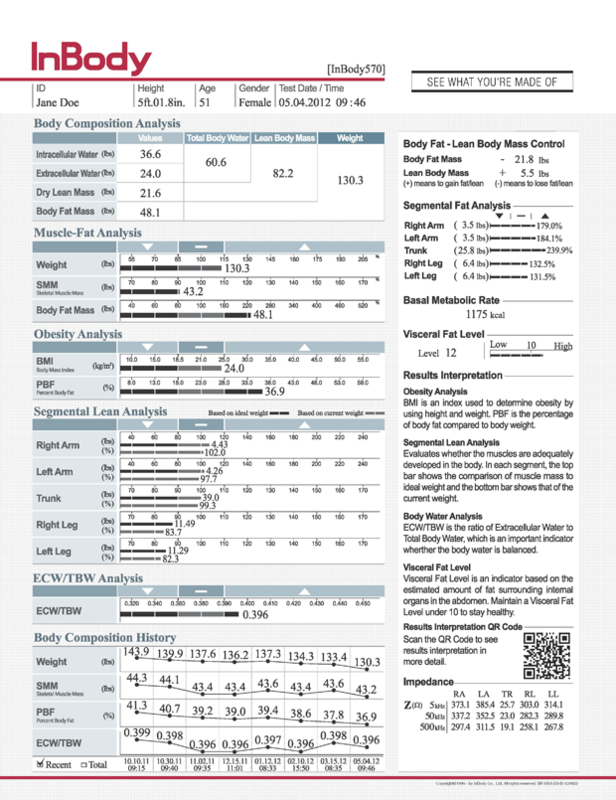 One of the best ways to get lots of great information is with the InBody composition analyzer. This is much more than the traditional scale – the InBody gives you a highly accurate reading of muscle mass both as a total number and in different segments of your body, fat mass including visceral fat, as well as your water weight both in and around your cells. What makes this better than a traditional scale ? There is no guessing anymore. You see very quickly what has changed – more muscle mass? more water weight? a loss in fat mass? no more guessing if your workouts and dedication to a good diet are working or not. As a personal trainer the InBody is a great tool to have to help set goals that are appropriate and useful for the client. Build more muscle? sure lets look at where you are with muscle mass both overall and in each limb, set a goal and start the program. With frequent weigh-ins you can see the changes that are being made and make corrections to the workouts as needed. With a traditional scale none of that information is available and it is much more of a guessing game. Was that fat that they added? muscle? did they drink more water in the past 24 hrs? Is the program I set up working for them? The InBody composition analyzer is simple to use. Just step on the scale and 45 seconds later you have a complete printout of all your information. The next part is what do you do with all of that information?